Faster Food If I Had Caught It Myself! Fitting with the travel theme of this blog, I was at a conference with several coworkers last week getting “knowed up” on the latest and greatest in our profession. Thursday evening, we decided to get a more substantial dinner after the evening social. So we headed down further into downtown Yakima, Washington and happened upon Café Melange. It looked nice, and very upscale, so we decided to try it out. When we arrived the restaurant was half full – there were about 9 tables in all. We were seated right away, and they brought us water and menus. And that’s when it started going downhill. Because then we sat. For over a half hour. The server explained once that she was getting caught up and would be right back over, but then we sat for a while after that. The two couples that came in and were seated after us got to order before us. After about a half hour, the server FINALLY took our order. We thought – “ok, we’re moving now!” But no, even though we only ordered appetizers, we were in for more waiting. Let’s put it this way, I probably could have left the restaurant, gone to the grocery store, bought all the ingredients, rustled up plates, utensils and a frying pan and hot plate at the hotel, and still had our appetizers prepared before the restaurant did. It took SOOO LONG! I’m glad Jon wasn’t there, because he would not have been able to handle it. Once we got our food (after losing 5 pounds, I swear! ), the appetizers were very good. I liked my crab cakes, although they were a little too spicy (they had jalapenos in them). The Caprese salad was good and the tapenade plate was good too. They each seemed a little high priced for what you get though (chalk it up to it being an upscale restaurant). After we were served, our server cheerfully asked us if it was worth the wait. It was certainly the wrong thing to say at that point – you should have seen the looks on our faces when she said it! After we finished our appetizers, we had to wait for awhile for our server to stop flirting with the gangsta/hoodlums who had come in before she would come back to our table. All 5 of us had our credit cards neatly placed on the table beside our plates, yet she still asked if we wanted dessert! Several in our group had wanted dessert, but by then it was way past our bedtime, and if we had ordered dessert we probably would have been stuck there another hour and a half. Then after she ran the bills, she managed to drop the credit card slips all over the floor on her way back to the table. It was like the Hansel and Gretel trail of breadcrumbs! All in all, we were there for over 2 hours, for appetizers and water. I don’t think I need to say that I’m sure none of us will be going there again. And if you are ever in Yakima, I would steer clear of Café Melange. Unless you are not hungry at all – then it might be a pretty cool place to hang out! Easter Sunday was a beautiful sunny day, and we didn’t have much going on, so Jon and I decided to take a walk to the Sehome Arboretum near our house. This large, natural wooded 180 acre city park is a joint partnership between the city and the University. The history of the park is quite rich, with coal mining in the 1850s and logging throughout the 1800s. 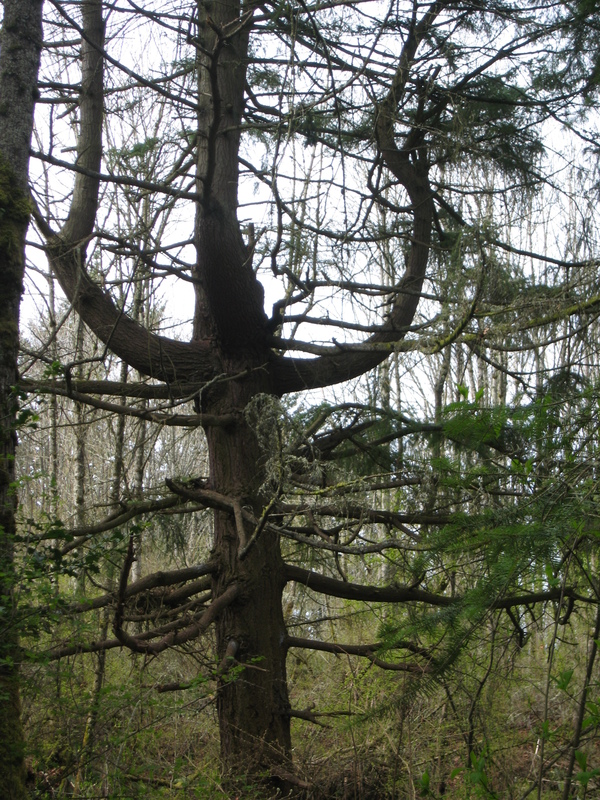 It is now second growth forest and the last time it was logged was 1906. 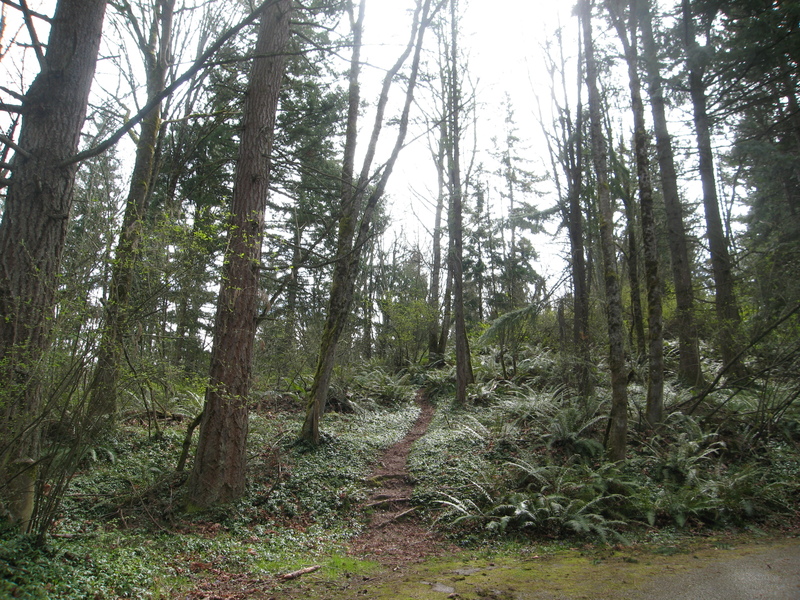 It was developed with some roads in the early 1900s and became a park in 1922, and was designated an arboretum in 1967. Most of the park is closed to cars now, so it is a wonderful oasis for walkers and hikers, right in the middle of the city. Technically, it isn’t an arboretum, because it wasn’t consciously planted with native plant species, and non-native species are not actively removed, but it still gives you a sense of what the area was like before modern settlements. We are lucky enough to be only a half block from the Arboretum, but we do have to walk a few blocks to reach the trail head entrance. 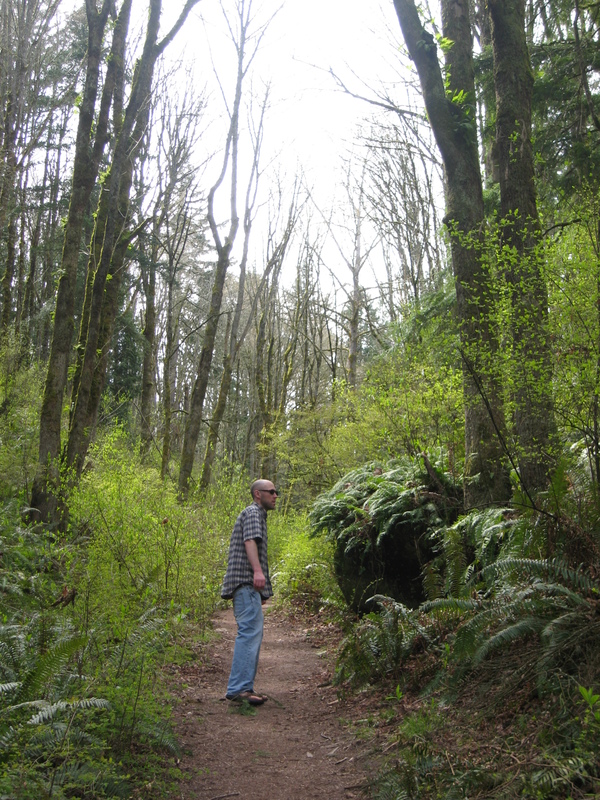 We headed up into the park, and at the beginning, the climb is fairly steep. You are immediately surrounded by tall trees and native undergrowth, and the surrounding homes and neighborhood quickly melt away. We headed first up to the tower, which is an 80 foot observation tower with views of Mt. Baker, and the Bay to the west. This is generally the busiest part of the park, with families and children there most of the times I have walked there. 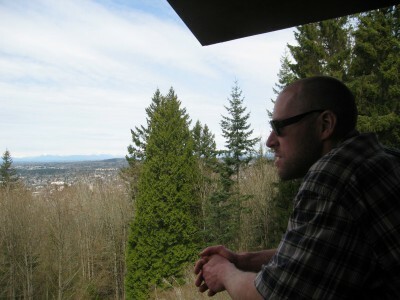 It is still very peaceful and nice to just take a few minutes to enjoy the view. Jon has a hard time sitting still for long though, so I had to encourage him to relax and slow down. 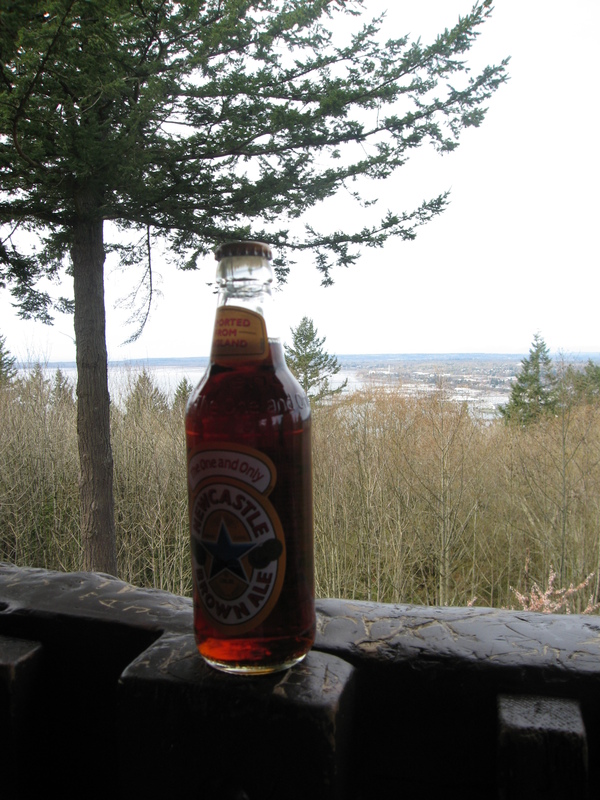 The local college students were having an Easter Beer Hunt, where they hid cans and bottles of beer throughout the park for the hunt. It reminded me of a condom hunt they have every year for Sexual Awareness Week, but somehow I think the Beer Hunt isn’t sponsored by the Associated Students Club. Jon and I found several beers, but we left them alone so the students could have their fun. We left the tower and headed deeper into the Arboretum. At this point, we were on an old road that was built in the 1920s, but closed to cars in 1967. 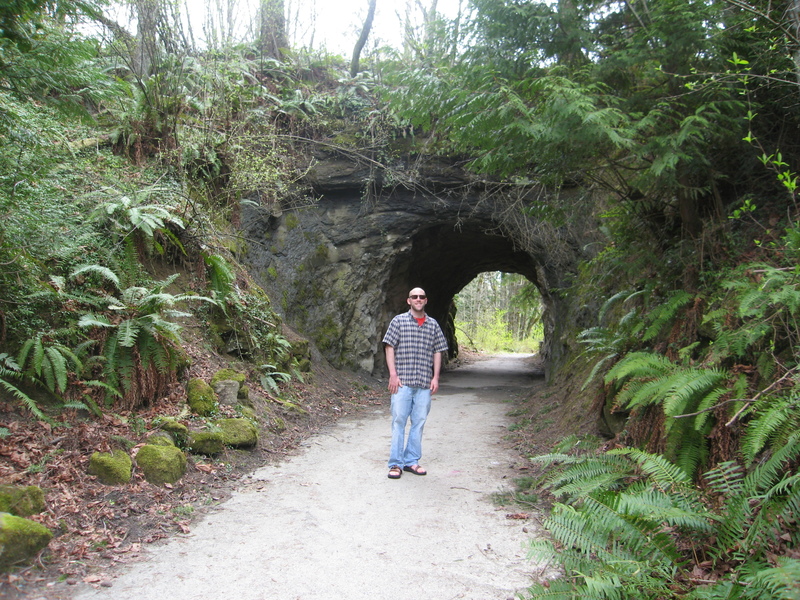 We walked through a sandstone tunnel that was carved by hand in 1923. You can see that it was carved for the tall narrow cars of the day, and it would be a tight squeeze for our modern cars. They say that there are old coal mines throughout the park, but that the entrances were not mapped and their locations are no longer known. Perhaps at some point we will venture further off the beaten path and see if we can find some! This time we kept to the main trail, which then meets up with the road where cars can travel up into the parking area in the park. There were only 3 cars there, and I think most of the visitors to the park are college students and neighborhood residents who live close enough to walk, like we do. 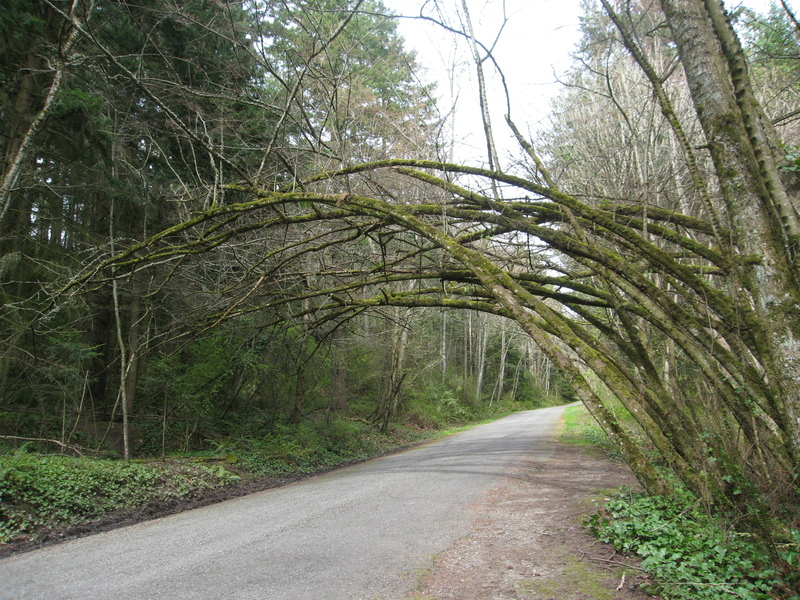 The road has a spot where the trees have been intentionally bent over the road, creating a cool natural arbor. We checked that out and then continued on our way, finding one of the smaller trails that connects with Sehome High School. At that point, we left the park in search of some cool drinks and headed home for Easter dinner. I do see more exploring in my future though! The Crusher – What More Can I Say? Let me just say, I wasn’t at a WWF match over the weekend, although with a wine named The Crusher, I can’t blame you for being confused. I’ll explain. On the day that Jon and I went down to see Gauguin at the Seattle Art Museum, we stopped at the Cost Plus World Market on the way home and perused their wine selection. They sometimes have a better price on a wine we have had before and liked, and they carry a lot of California wine that we haven’t seen anywhere else. The Crusher was one of those. Of course, the first thing that catches your eyes is the name. But the label is so nondescript! I suppose if you have a knockout name like The Crusher, you have to tone down the rest of the label to be taken seriously. I picked it up and saw that it is a Rose of Pinot Noir (one of my favorite grapes!) from vineyards in Clarksburg, produced by Don Sebastiani and Sons (who apparently also produce Smoking Loon, Pepperwood Grove, and several other brands I hadn’t heard of). But at the $6.99 price point, I was willing to take a chance on an unknown. We brought it home and it sat on the “everyday drinking wines” rack, and I opened it up last night with dinner. When we first opened the bottle, the wine didn’t have much of a nose. It was hard to get a sense of what it would taste like. So we poured. And swirled. And sniffed again (still not much smell). So we tasted. My first reaction was… eh… not much there. It was ok. And I kept working on dinner and came back to the glass about ten minutes later. 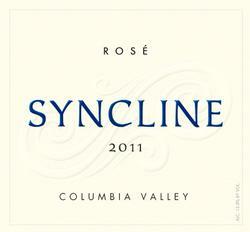 Now I smelled just a hint of strawberry, with a tiny bit of smoky spice. And the second taste was much improved. This is a good everyday wine. It is very dry, which cuts off the lingering sweetness of the strawberry flavor. My only complaint is that the finish is a teensy bitter. But for $6.99, I would certainly buy it again when I see it around – but I’ll let it breathe for a little while before the first taste. 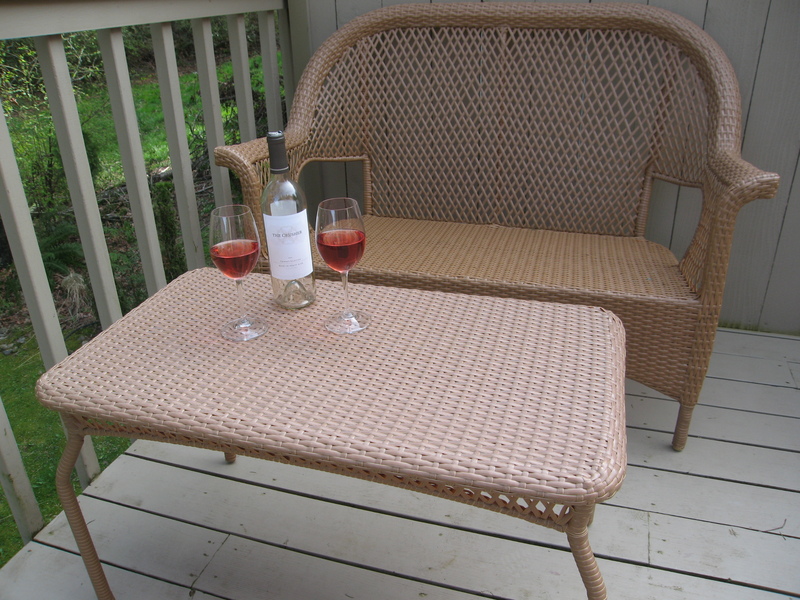 A great summer patio wine! And this takes the cake. This evening, day two of this bottle, I was sitting on the deck in the sunshine writing this blog post, when a hummingbird flew up and hovered about a foot from my face, and only about 2 inches from my glass of The Crusher Rose. He was checking it out! That was very neat to see. I toyed once before on this blog with the idea of doing the Willamette Valley Wine Country Half Marathon. It is in the Willamette Valley and after you finish the half marathon, there is a wine tasting at the finish line. It sounds like my kind of competitive exercise! Something with a real incentive to finish quickly! Why race for a medal when you can have a souvenir logo Riedel glass – with WINE IN IT! Well, during a discussion with a friend and a few other women last weekend, I mentioned that the Wine Country Half Marathon would be one I would be interested in doing someday. You would have thought I suggested that we do an Ironman Competition across the Sahara desert during the height of summer with no water. My friend’s friend seemed shocked and more than a little disappointed that I would even suggest – GASP! – drinking wine after walking 13.1 miles. I really think it was all she could do to hold back from giving me a stern lecture on my clearly irresponsible lifestyle. Mind you, I didn’t suggest drinking ONLY wine after the race. I’m as aware as anybody of the need to rehydrate after working out. But as long as you drink enough water, I just don’t think that a glass or two of wine is going to do any lasting damage. But apparently there won’t be any convincing this woman that my plan wouldn’t be a certain voyage to an early grave. Lesson learned – I won’t be bringing up any “St. Patty’s Day with Green Beer at the End Fun Runs” up with this gal any time soon. But geez, there’s something to be said for having a bit of fun. Maybe next time I see her, I’ll mention that sometimes I drink wine the same day I donate blood. Can’t wait to see the reaction I get from that one! I know, Mom, I’m evil. I just can’t help it. So, I’m deep into another long work week and have been so busy I didn’t even have time to tell you about last weekend or my latest wine find. I did have the opportunity to go for a couple of 5.2 mile walks over the weekend with a good friend of mine, one on Saturday and one on Sunday. This is twice each day around one of the local lakes, that has a good walking path all the way around. There’s just something about a nice morning workout that gets my day started off on the right foot. Sadly, since we moved, I don’t live as close to this friend anymore so we aren’t able to walk on the weekday mornings now, so it’s back to my treadmill during the week. It rained for a significant portion of the weekend. Most of Saturday the rain came down. And it rained off and on Sunday too. But the funny thing is, I was able to get both of my walks in without any rain – all 10.4 miles of them (although we did feel a couple of drops at the end of the walk on one day). So to celebrate the weekend rain, and the lack of much in the way of spring weather so far this spring, I was in the mood for some Sauvignon Blanc. 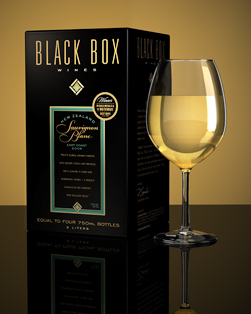 Because Sauvignon Blanc is just one of those varietals that screams ,“hot summer day on the patio!” We had purchased a couple of Black Box boxed wines a few months ago, because I had a $10 rebate coupon for each box, up to 2. We had intended to use it as overflow wine when we have guests over, kind of in the spirit of The Third Bottle brand of wine that Gustavo Thrace Winery makes (I’ll blog about that one in another post – I promise!). We purchased this Sauvignon Blanc and the Black Box Malbec at the same time, and we drank the Malbec some time ago, but we pulled out the box of Sauvignon Blanc more recently. We didn’t open it for a party, as we had intended, but instead Jon pulled it out on some night when he didn’t have any other everyday drinking wines on hand. Black Box wines retail for between about $17 and $20 per bottle, but you get the equivalent of 4 bottles in the box. For some of us, the idea of having 4 bottles of wine all open at once is rather daunting, but the makers say this packaging will keep the wine fresh for up to a month! Jon and I didn’t test that theory, but we did open the package a little more than 2 weeks before we finished it off, and the wine was still fine. That’s way better than some other wines I’ve had! The wine itself is a solid, yet run of the mill, true to the varietal Sauvignon Blanc. It is crisp without much minerality (to honest, if I were to change anything about this wine, I would give it a little more minerality), and it was a little tart with a hint of citrus. There’s nothing amazing about the wine, but nothing that’s going to turn you off either. For an everyday drinking wine in the $4-$5 bottle price point, it is certainly a keeper. And it keeps. Saturday night I started out with a rather large glass. There was only a little more in the box and I was just trying to finish it off (I didn’t realize it would end up being so much – the bag the wine is contained in can be deceiving). At any rate, I was more tired than I realized Saturday night and ended up not really in the mood for a mondo glass of wine, so I left most of the glass on the counter for Sunday. Heck I thought, if it was really bad, I could always pour it out. But on Sunday, despite the fact that it had been sitting out in a glass for 24 hours and it was not chilled, it was still a very pleasant glass of wine! That itself deserves major points. I would certainly recommend this wine, as long as the package size isn’t too large for you to finish in less than the month time limit. Although I supposed if you are coming close to week 3, you can always throw a party and get some friends to help you out. Enjoy.